Exercise can enhance the development of new brain cells in the adult brain, a process called adult neurogenesis. These newborn brain cells play an important role in learning and memory. A new study has determined that mice that spent time running on wheels not only developed twice the normal number of new neurons, but also showed an increased ability to distinguish new objects from familiar objects. These results are published in the first issue of Brain Plasticity, a new journal from IOS Press. “Our research indicates that exercise-induced increase in neurogenesis improves pattern separation by supporting unique and detailed long-term representations of similar but nevertheless different memory items. Pattern separation is involved in many memory tasks of everyday life. For example, when learning the game of chess, it is critically important to remember the different shapes of pieces like the pawn and bishop. Similarly, remembering the precise pattern of pieces on the board during a previously successful opening or endgame may decide who will win or lose,” explained lead investigator Josef Bischofberger, PhD, Professor, Department of Biomedicine, University of Basel (Switzerland). “This study provides novel evidence for running-induced enhanced pattern separation. 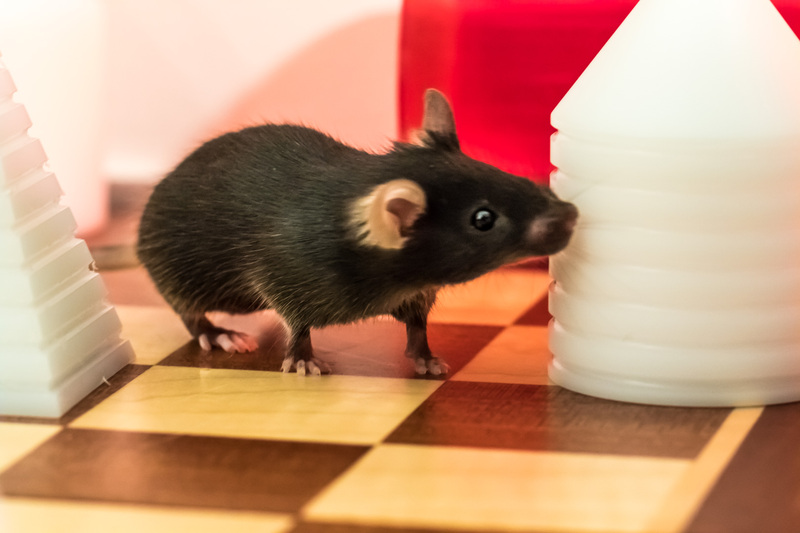 The experiments are based on an innate behavior of mice, which are naturally curious and preferentially explore novel objects in their environment. Objects were designed to be more or less similar to each other, to test how precisely the animals remember object properties. This is unique, in being both not stressful and not requiring additional motivators, such as food or water deprivation, to demonstrate the beneficial effects of exercise on cognition,” commented Brian R. Christie, PhD, Co-Guest Editor of the issue and Professor, Neuroscience Graduate Program Director Division of Medical Sciences, University of Victoria, and Island Medical Program, University of British Columbia. Professor Bischofberger and co-investigators Stefanie Heigele, PhD, and Leoni Bolz tested two groups of mice, which were housed either without (sedentary) or with running wheels (voluntarily running) using a novel object recognition (NOR) task to assess learning and long-term memory. As rodents prefer to spend more time with novel objects than familiar ones, the researchers first exposed the mice to two identical objects (cones or pyramids, in either black or white). After 1.5 hours, one of the objects was replaced with a new object (cone for pyramid or vice versa) and the mice were observed. After 24 hours elapsed, the new object was again swapped, either with a similar object (same color but different shape) or a distinct object (different color and shape). Caption: As rodents prefer to spend more time with novel objects than familiar ones, the researchers first exposed the mice to two identical objects for habituation (cones or pyramids) and later measured the animals attention towards a novel object with different shape. Photo courtesy of Josef Bischofberger, University of Basel. After the short 1.5-hour interval, both running and sedentary mice were able to distinguish similar and distinct objects. However, after 24 hours, a difference was observed. Whereas distinct objects were remembered and recognized by both cohorts of mice, only the running mice could faithfully distinguish similar looking objects. Investigators determined therefore that the running mice had developed better pattern separation capabilities than sedentary mice. The inaugural issue of Brain Plasticity features ten papers that focus on the effects of physical exercise on brain function in animal models. Exercise is a simple, low-cost intervention that promotes cognition and mood, protects against damage associated with neurodegeneration, and may alleviate drug addiction in humans. The mechanisms underlying the beneficial effects of physical activity are the subject of intense investigation. The scientists who have contributed to this issue are working on basic research into the cellular, molecular, and behavioral changes associated with running. “Running Improves Pattern Separation during Novel Object Recognition,” by Leoni Bolz, Stefanie Heigele, and Josef Bischofberger (DOI 10.3233/BPL-150010) is openly available at http://content.iospress.com/articles/brain-plasticity/bpl150010, Brain Plasticity, Volume 1, Issue 1 (2015). Contact Daphne Watrin, IOS Press, at +31 20 688 3355, d.watrin@iospress.nl for additional information. Journalists wishing to interview the authors should contact josef.bischofberger@unibas.ch. This entire issue is openly available at http://content.iospress.com/journals/brain-plasticity/1/1. Bolijn, Simone; Lucassen, Paul J.
Petzinger, G.M. ;Holschneider, D.P. ; Fisher, B.E. ; McEwen, S.; Kintz, N.; Halliday, M.; Toy, W.; Walsh, J.W. ; Beeler, J.; Jakowec, M.W. Somkuwar, Sucharita S.; Staples, Miranda C.; Fannon, McKenzie J.; Ghofranian , Atoosa; Mandyam, Chitra D.
Hamilton, G.F.; Majdak, P.; Miller, D.S. ; Bucko, P.J. ; Merritt, J.R.; Krebs, C.P. ; Rhodes, J.S. Patten, Anna R.; Yau, Suk Yua; Fontaine, Christine J.; Meconi, Alicia; Wortman, Ryan C.; Christie, Brian R.
Sleiman, Sama F.; Chao, Moses V.
Brain Plasticity publishes peer-reviewed original articles, reviews, and short communications on all aspects of neurogenesis, gliogenesis, and synaptic plasticity, from development to the adult. This includes research articles or reviews on modifications to neural circuits in the developing and adult brain, whether by learning or physical activity, spine formation, changes in neural structure, changes in neural networks, new cell division, as well as response of the CNS to experimental injuries, neurodevelopmental and neurodegenerative disorders. Papers adopting fresh conceptual approaches on specification and function at the molecular and cellular levels, neural circuits, systems and behavioral levels are encouraged.